Supernatural has just begun its seventh season, we’re only on episode two, and the energy from this year has already surpassed last season. We are getting brother moments, continuity, emerging bad guys for the seasonal arc, and so much trauma that you don’t know if you can survive all the hits that keep on coming. It’s what made me fall in love with the show in the first place and what makes me so excited for this season. Let’s get the starting traumatic event out of the way first — Castiel. At first he was leaking, oozing that black goo out of his body and assuring the audience that all was not well with his vessel. Then he was shambling through the corridors like a zombie, which I salute Misha for getting down perfectly. 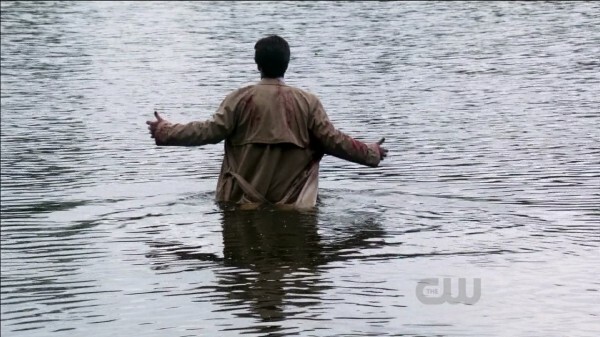 And finally we got to the big event, which was Leviathan!Cas walking out into the reservoir, sinking beneath the surface, and then disintegrating into the water into a black stain that was meant to carry his wrongness out amongst the people. As an aside, choosing “Black Water” by the Doobie Brothers as their musical cue in that event was genius. I’m very sorry to see Misha go, but I don’t think it will necessarily be forever. The Leviathans are still reporting to a big boss and that could very likely be Leviathan!Cas. He released the creatures out into the water, but he didn’t necessarily have to release all of them. Though, I guess if he does emerge again, he’ll have to get a new wardrobe since Dean’s lovingly holding onto his trench coat in memory. I have to admit that I thought they’d let Leviathan!Cas keep the creatures inside of him for a few episodes longer, slowly building up until bursting from the inside out, and letting Misha go wild with his “I can act insane, just watch me” approach to this character. However, the show instead wanted to get the Leviathans out of his body and into multiple bodies very quickly. That’s fine, spread the danger, it amps up the pressure. I am a bit confused about the rules of these creatures, though. 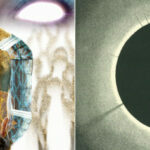 They can take over a body, as we saw, but apparently they can shapeshift into another body, too, if they just touch you? That seems a bit too easy, but it also opens the door to plotlines where Sam or Dean could be interacting with a person who turns out to be the Leviathan instead. Lots of mistaken identity action is possible! And it’s not like they’ll be easily defeated, as we saw at the end of this episode. These creatures don’t die, which is a downer for a hunter. How can you kill something that can’t be killed? That’s the question that we’ll have to deal with this year. Next up is Bobby. He’s trying to keep everything together, but it’s hard. His boys are falling apart, his only living local “friend” is calling up about monsters in the hospital, and now his house has been reduced to a pile of burned wood in the middle of a crater. 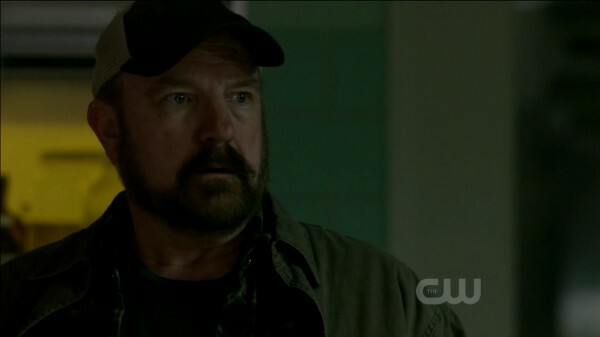 Fun times for Bobby Singer! I have no fear about Bobby being dead, not yet anyway, but I am grieving the loss of all those books in his house. He was the library of knowledge and now all those ancient texts are gone. It’s not I was thinking they’d uncover the answer to this Leviathan problem by going through Bobby’s library, but there are other hunters out there doing more routine hunts and I’m sure they could have benefited from some of that research. Nope, all gone. Good luck in your future ventures. I do like that Bobby is trying to keep both Sam and Dean on balance, even though he knows both of them are one step away from a psych hospital. Dean’s not fine, Sammy’s really not fine, and Bobby’s the only sane one they’ve got left to depend on. And, no pressure, but he’s got to hang on so that Dean doesn’t pull off a double suicide with his brother. Can the man not have one day of peace? Not likely. I do wonder where he’s going to live now. Maybe Sheriff Mills will be so appreciative of his help, if they ever clean out the hospital, that she’ll let him stay in her guest room for a while. Yeah, probably not. I’m seeing more motels in Bobby’s future. 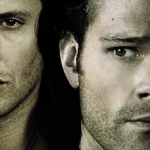 And finally we have the very screwed up Winchester brothers. Dean’s going to crack. I don’t know when, but he’s going to crack. He can pretend he’s fine, but then the truth comes out that he’s holding on by a thread and if one more thing goes wrong, if one more person he cares about dies, he’s taking Sam and they’re going out of this world together because he can’t deal with the aftermath. He’s been increasingly alcoholic since he got back from Hell, his depression has amped up considerably and is actually more in the audience’s face now, and he’s been shoving all that pain and misery down for so long that there’s just not any room left anymore. He might not be having hallucinations like Sam, but he’s just as in danger of ending up in need of psychiatric help. Poor Sammy is just messed up beyond anything he’s ever faced before. This isn’t some curse that they can lift or a spell that they can reverse, this is a mental break. And coupled with that is the admission that apparently Lucifer touched him in a bad place, if the hallucination is to be believed, which supports my theory that Alastair did the same thing to Dean. I had long suspected, but Dean’s not going to talk about it, so we get Sam trying to work through the trauma of his own violation and it’s not going so well. And when you’re working through the multitude of issues, you need a support system you can rely on. 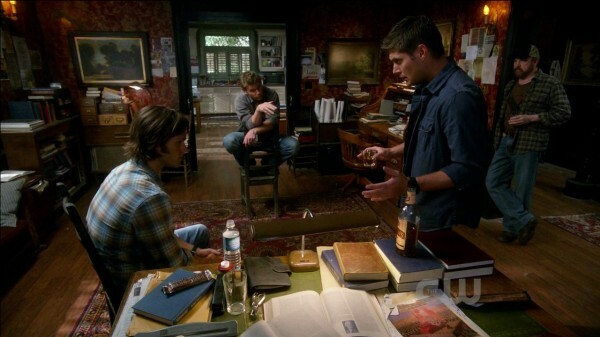 Sam’s got it, with Dean and Bobby, but perhaps the guys need some refining on how exactly you approach this situation. I wish someone would sit Dean and Bobby down and explain that when you have a person going through a psychotic break like this, perhaps it’s not a good idea to give them a loaded weapon and a steady supply of alcohol. 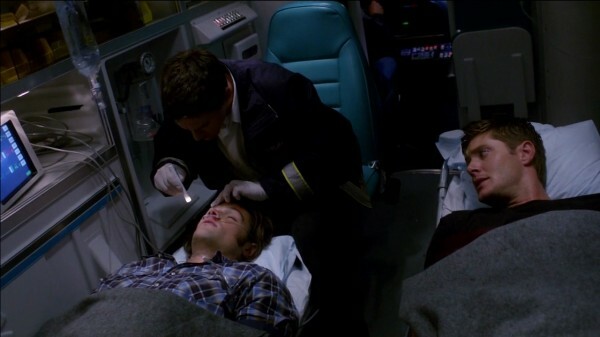 It continues to bug me, ever since Dean left Sam’s loaded weapon beside his unconscious body in the Season Six finale. Take away the mind-altering substances, take away the clips, and protect Sammy from himself. But we have larger issues to deal with, namely the best twist that Lucifer could have done: have Dean be the one screwing up Sam’s mentality. “I thought I was with you, Dean.” Such a sad line and a nice reveal on how Sam tries to ground himself. Dean is his touchstone, so he thinks Dean is always real. Turns out, not so much. I did adore Lucifer!Dean, though. So twisted, so manipulative, so right. But I was left a bit confused by the warehouse scene, since I’m unsure what’s real and what’s not anymore. How did Sam get there in the first place, considering the Impala wasn’t real? Was it the van we saw Dean looking at before he went in? I’m going by that theory. And even though we got a partial explanation for Sam’s hand injury, I don’t think that could be the whole thing. The cut wasn’t that bad to begin with, the stitches make it seem like it was much worse, and either way it should have been healed by now. It’s been a long time since he hurt himself. Did some of the Leviathan or angel blood get into it and that’s why it’s slow-healing? Or did they really keep it in a bandage this long just so Dean and Sam could use it for a pain point? I hope not. And I also hope this isn’t how Sam’s going to ground himself in the future, by self-injuring anytime he questions what is real. Finally, I want to say how impressed I am with the season’s continuity! We will have had a continuous episode line, wherein the beginning of one ep picks up right where the last ep ended, from 6.22 to at least 7.03… and maybe there will be more. It could get claustrophobic if it’s done the entire season, or it could be interesting. We’ll have to see how long they keep it up. But for now, we get to have consequential injuries. Sam gets cut in one episode, he’s got a bandage on it during the next episode. Dean gets his leg broken in this episode, he’s still got the injury in the next episode. 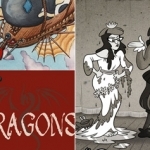 Continuous storytelling is wonderful, as is this season. I’m so excited about how Season Seven is starting. They’ve set the bar high and I can’t wait to see how they continue at that level. 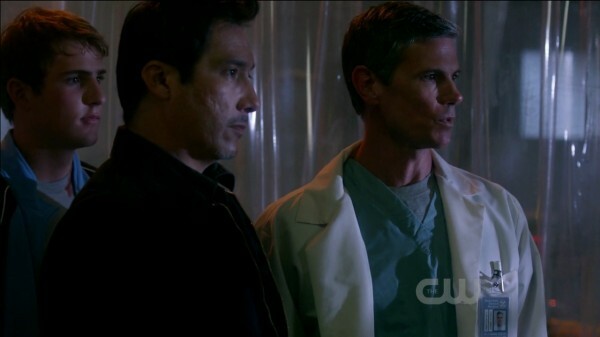 About how Sam got to the warehouse – Lucifer says that he controlled him that whole trip. 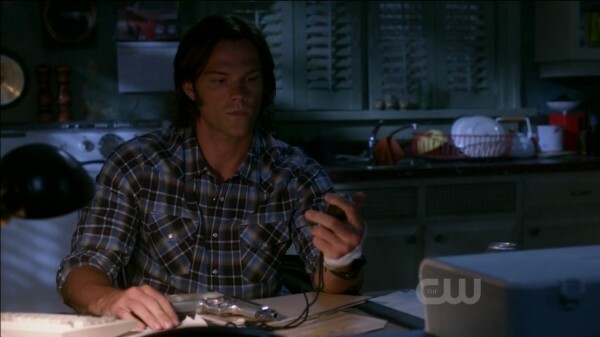 He even says something like – Sammy is so easy to control. It seems possible that he’s the Leviathan boss, which would be a nice twist for the boys to have to go up against the body of their friend as the Big Bad (again). I don’t know if Cas is still in there, somewhere, but I’m sure we haven’t seen the last of Misha at least. So broken, both the boys are so broken. I love that they’re exploring these issues this season. They know how to fight monsters, but mental breaks aren’t so easy to defeat. It’s going to be an interesting journey to see how both Dean and Sam deal with their own faltering mentalities.